Not much spoken about, and not much bothered about. That pretty much sums up the life story of zinc. But let us tell you, if we don’t have enough of that mineral in our system, our life story would be summed up quite differently. Which is something we wouldn’t want. Not once. Not ever. And hence this post on foods high in zinc. One question – why is it important? Keep reading to find the answers. Here you will learn about 25 zinc rich foods and much more. The right time to ask the right question. Because what’s the point in knowing about the foods rich in zinc without first knowing the nutrient’s importance? Zinc is a trace mineral. But it is found in cells throughout the body. The body’s immune system requires zinc to function optimally. And guess what – it also helps you use the senses of smell and taste. Zinc helps in the production of about 100 types of enzymes in our body. It acts as an antioxidant and neutralizes the effects of free radicals, reducing risk of cancer. It also stimulates the production of blood in the body. Zinc promotes the synthesis of collagen, which is a necessary element in wound healing. More importantly, zinc is a must during pregnancy, infancy, and childhood. The body needs zinc to grow and develop properly. Simply put, it could be a trace mineral and your doctor would have forgotten to stress on its importance – but you would only be inviting illness without adequate levels of zinc. What Is The Recommended Daily Allowance Of Zinc? This table (as per the Institute of Medicine, Nepal) will help you get an idea. That’s with the dosage. But how do you ensure you are getting enough of it? Well, these foods rich in zinc can help. What Are The Foods High in Zinc? 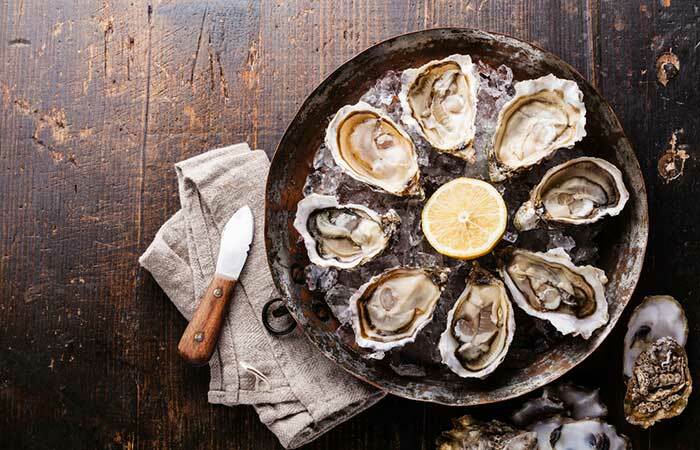 Apart from zinc, oysters are also rich in protein. And the best part is they boost your protein intake without increasing your fat consumption. They are also rich in vitamin C – one serving covers about 15 percent of your daily requirement of the vitamin (1). Vitamin C is great for immunity while protein enhances muscle and cell health. You can have them broiled with herbs. Even raw oysters work wonderfully well, especially when combined with horseradish. But be careful where you get them as they also are a common cause of food poisoning. Sesame seeds are also a great source of phytosterols, compounds that help lower cholesterol. Another compound in sesame seeds, called sesamin, helps balance hormones and boosts overall health. The seeds are also high in protein (2). You can use sesame seed butter in the place of peanut butter on your toast. The seeds also pair very well with salmon or chicken – you can make a delicious homemade granola. Flax seeds are also extremely rich in omega-3 fatty acids – nutrients that boost heart and brain health – in addition to offering numerous other benefits. The seeds also aid in the treatment of arthritis and inflammatory bowel disease (3). You can add ground flax seeds to your breakfast smoothies or salads. You can also sprinkle the seeds on cooked vegetables. Pumpkin seeds are also rich in phytoestrogens that improve cholesterol levels in postmenopausal women (4). The seeds are also rich in antioxidants that give your health a boost. You can add the seeds to your bedtime salad – this nighttime snack can also boost sleep quality. One of the most popular breakfast choices, if you ask us. The most important nutrient oats contain is beta-glucan, a powerful soluble fiber. This fiber regulates cholesterol levels and enhances the growth of good bacteria in the gut. Oats can also improve blood sugar control, and that’s something important, given the rise in diabetes cases across the globe (5). You can simply have oats for your breakfast. That would be the easiest way to increase your zinc intake. 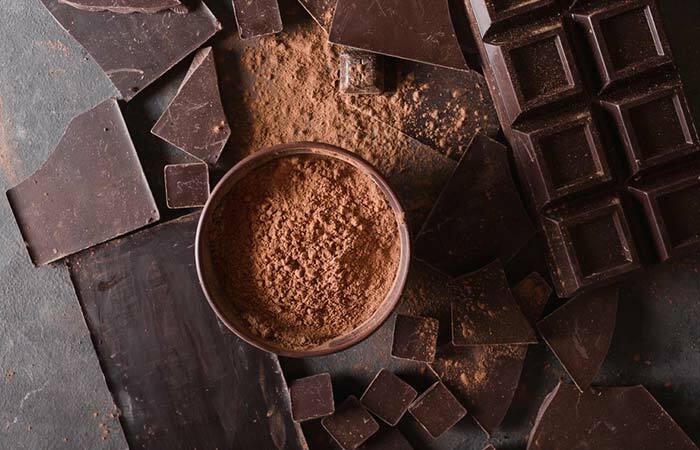 The zinc in cocoa powder enhances immunity, and given it’s something we all love (that finger-licking dark chocolate) – getting adequate amounts of zinc shouldn’t be a problem. Cocoa powder is also rich in flavonoids that boost immunity. Add cocoa powder to your coffee or tea. You can also use unsweetened cocoa powder in gravy, protein shakes, and hot cereal. It is important to note that cheese is one healthy source of calcium – the mineral you need for strong bones. And since it is an animal source, Swiss cheese is considered a complete protein – it contains all the amino acids your body requires to make protein. However, practice moderation as Swiss cheese also contains saturated fat that may not be healthy if taken in large amounts. You can add a slice of Swiss cheese to your sandwich or bowl of soup. Add shredded cheese to your vegetable salad. Or have it with scrambled eggs. Egg yolk is replete with other nutrients as well. It contains vitamins A, D, E, and K. The yolk is also rich in omega-3 fatty acids. And more importantly, the yolk contains the antioxidants lutein and zeaxanthin – compounds that boost vision health (6). Boiled egg yolk is a good option – you can add it to your salad. Apart from zinc, lima beans are also rich in folate – a nutrient required for DNA synthesis and cell division. The beans are also rich in vitamins B1 and B6. And the fiber in the beans protects the colon and fights digestive cancers (7). It also can promote satiety and eventually encourage healthy weight loss. You can add dried lima beans to your evening bowl of soup. A combination of bacon and eggs with lima beans just sounds so wonderful. Apart from helping you get adequate amounts of zinc, kidney beans also reduce the concentrations of C-reactive protein, which is known to cause inflammatory disorders (8). The beans also control blood sugar levels and invariably help in the treatment of diabetes. They can be a simple addition to your regular fruit or vegetable salad. Or you can have canned beans as a healthy evening snack. Even adding them to hearty soups or stews can work well. 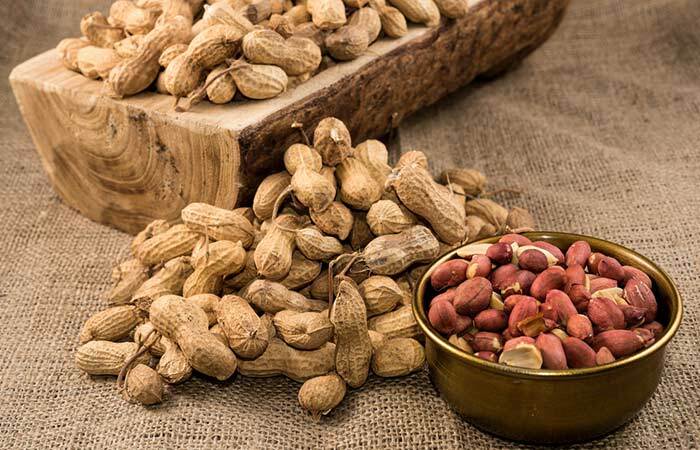 Peanuts are also a host to a number of heart-healthy nutrients. These include niacin, magnesium, copper, oleic acid, and various other antioxidants (include the all-popular resveratrol). Peanut consumption has also been linked to a reduced risk of gallstone development in both men and women. This could be attributed to the cholesterol-lowering effects of peanuts as gallstones are mostly made of cholesterol. Eating them right out of the shell could be the best way. Cracking and snacking, as we can also call it. Grab a handful of peanuts as you sit to watch the evening sitcom – and yes, crack and snack. Or wait, you can also add peanuts to granola bar recipes. Lamb is primarily comprised of protein, and well, it is high-quality protein that contains all of the essential amino acids. Lamb protein can be especially beneficial to bodybuilders, recovering athletes, or even patients who are recovering from a surgery. One important amino acid in lamb, called beta-alanine, improves physical performance (9). Lamb chops or roasts or steaks can be a good addition to your dinner. Almonds are the most popular of the nuts, and probably the tastiest too. They are loaded with antioxidants that relieve stress and even slow down aging. The nuts also contain high levels of vitamin E, a nutrient that protects the cell membranes from damage. The vitamin also decreases risk of brain diseases like Alzheimer’s (10). Have a handful of almonds in the morning with breakfast and at night before hitting the bed. You can also add chopped almonds to your favorite smoothie. Just like most animal meats, crab is also a complete source of protein. And it also is an impressive source of vitamin B12 – which aids in the production of healthy blood cells. The vitamin also decreases risk of heart disease. Simply sprinkle chopped crab onto a vegetable salad. You can also add it to your soup recipe. Even better, you can sauté crab meat with pea pods, mushrooms, and water chestnuts for a nutritious stir-fry. As they are particularly high in fiber, chickpeas can help regulate your blood sugar and cholesterol levels. This can prevent diabetes and heart disease. Chickpeas also contain selenium, a mineral that may help decrease the risk of cancer-related death. You can toss chickpeas into a protein-packed bean salad. Or you can use chickpea flour to prepare baked products. Even adding chickpeas to any vegetable soup can greatly enhance its nutritional content. Apart from containing decent amounts of zinc, peas are free of cholesterol and extremely low in fat and sodium – and doesn’t that sound like heaven? One antioxidant peas are particularly rich in is lutein. Our body deposits this antioxidant in the macular region of our retina, which helps filter light properly. This basically means that deficiency of lutein can cause eye ailments like macular degeneration and cataracts. Consuming peas can help prevent this situation. You can simply add peas to your vegetable salad. Even eating them raw can be a nutritious delight. Cashews are also rich in iron and copper that enhance blood circulation – they help the body form red blood cells and utilize them effectively. These nuts make a great replacement for animal proteins and fats – this is because of the mono and polyunsaturated fatty acids present in cashews, which reduce the build-up of fat and cholesterol inside the heart. Eating them raw as an evening snack is the simplest way to get your regular dose of zinc and other essential nutrients. Or you can also add cashew butter to your breakfast toast. The greatest benefit garlic has is for the heart. This (along with its other benefits) can be attributed to allicin, a compound that exhibits potent biological effects. And despite being highly nutritious, garlic has very few calories. It can improve blood pressure and cholesterol levels. It can fight the common cold. Its antioxidants also help prevent cognitive decline (11). More interestingly, garlic can also help detoxify the heavy metals within the body. Garlic is best consumed raw – when you peel the cloves and eat them. This could be hard for most people, given its pungent flavor. You can also crush the garlic and mix it with honey and spread on your toast – and munch your way to glorious health. Yogurt, in addition to zinc, is also rich in calcium. In fact, one cup of yogurt offers you 49% of your requirement of the mineral. Calcium helps maintain teeth and bone health, and the B vitamins in yogurt (vitamin B12 and riboflavin) protect against certain neural tube birth defects (12). Yogurt is also rich in protein, the importance of which doesn’t have to be reiterated. You can have plain yogurt with lunch. Or add a few berries to a bowl of yogurt for a healthy evening snack. Brown rice is also rich in manganese, which aids nutrient absorption and the production of digestive enzymes. Manganese also strengthens the immune system. Brown rice is also known to regulate blood sugar levels and aid in diabetes treatment. You can replace white rice with brown rice in your dishes. Compared to other types of beef, the grass-fed variety fares better. It has less total fat and more of the heart-healthy omega-3 fatty acids. This type of beef also has a higher amount of conjugated linoleic acid – which is known to cut the risk of cancer and heart disease. Grass-fed beef is also rich in vitamin E (13). You can toss sliced pieces of beef into your vegetable salad. 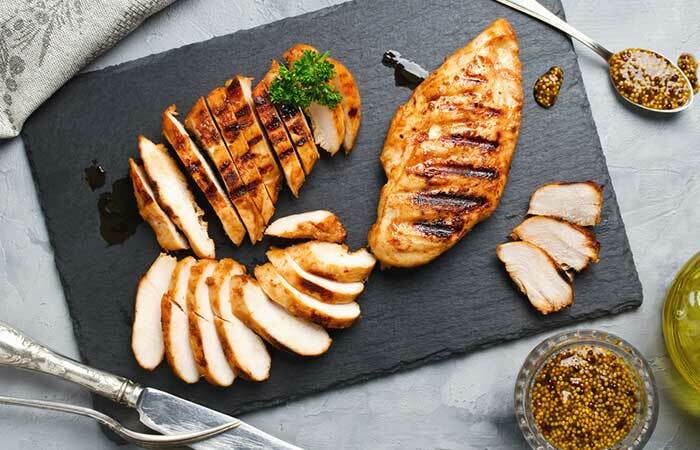 Chicken beats most foods when it comes to protein content. And it is also rich in selenium – another important nutrient that is known to combat cancer. The vitamins B6 and B3 it contains enhance metabolism and improve the health of the body’s cells. You can add cut chicken pieces to your lunch or dinner. Turkey is rich in protein, which can increase satiety and keep you full for long periods. This can discourage overeating. Getting enough protein can also keep insulin levels stable after meals. It’s always best to go for fresh, lean, pasture-raised turkey that is low in sodium. Eating whole turkey can be a good (and tummy-filling) deal. Mushrooms are one of the rarest sources of germanium, a nutrient that helps your body utilize oxygen effectively. Mushrooms also provide iron and vitamins C and D.
Adding mushrooms to your soup can take it to a whole new level. You can toss a few mushrooms to your vegetable salad. Or even add them to your curry. There was a reason Popeye relished this veggie. One of the antioxidants in spinach, called alpha-lipoic acid, lowers glucose levels and prevents oxidative stress – especially in patients with diabetes. Spinach is also rich in vitamin K, a nutrient required for bone health. You can add spinach to soups, pastas, and even casseroles. You can also add it to your breakfast sandwich. That was the list of foods rich in zinc. But wait, how do you know you are getting enough zinc? Following are the signs that tell you that you may not be getting enough zinc. Poor immunity. You catch cold regularly and suffer from all kinds of infections. Zinc blocks the release of histamine in the blood. When your body is deficient in zinc, you might suffer from allergy symptoms like rashes, sneezing, runny nose, etc. Sleep disturbance. Zinc plays an important role in the production and regulation of melatonin, the sleep hormone. When you don’t have enough zinc in your system, you can’t sleep properly. Hair loss. When your thyroid levels are low, it simply means your body is not absorbing zinc. And this causes hair loss. Attention disorders. There is a link between low levels of urinary zinc and hyperactivity. Poor skin health. Six percent of your body’s zinc is contained in your skin. Studies suggest that individuals with acne might have low levels of zinc. Slow growth. This can be a common sign in your kids. Our bones need zinc for healthy growth. Infertility or poor pregnancy results. Zinc plays a role in promoting the health of the reproductive system. And talking about supplements, we advise you to consult your doctor. Zinc supplementation can alleviate your deficiency – but it is best to talk to your doctor or nutritionist first. 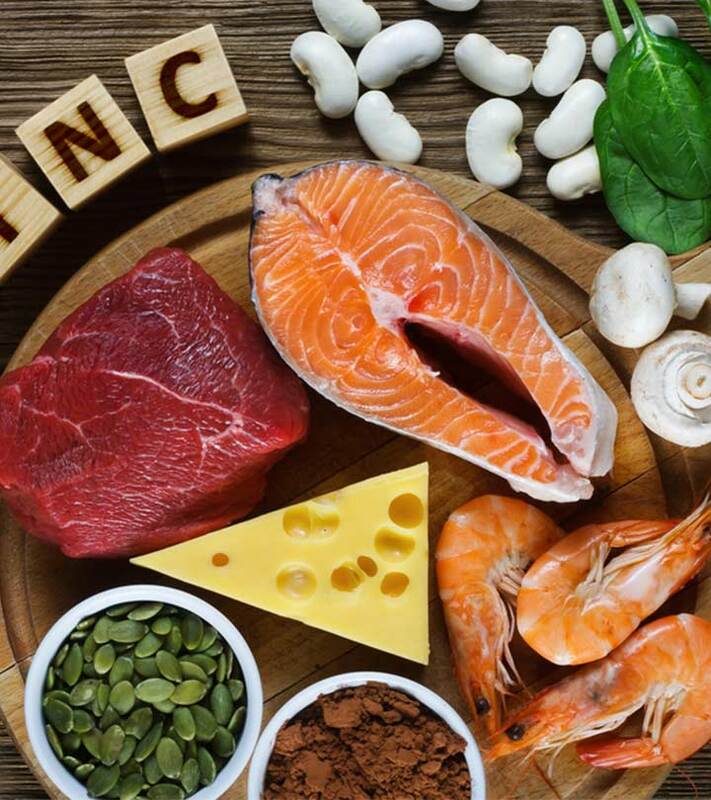 Who Is At A Risk Of Zinc Deficiency? Vegetarians or vegans, frequent dieters, individuals consuming too much of alcohol, or even elderly people. Pregnant women or lactating women, teenagers during puberty, and people with diabetes, celiac disease or recurring diarrhea are also at risk. Include these above foods high in zinc in your diet. That’s it. And wait, tell us how this post has helped you. Do comment in the box below. Help us serve you better. Cheers! “Mollusks, oyster, Pacific, raw”. United States Department of Agriculture. “Value addition in sesame”. National Bureau of Plant Genetic Resources, India. “The benefits of flaxseed”. United States Department of Agriculture. 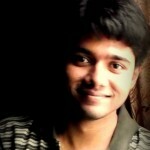 “Improvement in HDL cholesterol…”. University of the West Indies, Jamaica. “The metabolic effects of oats intake…”. Sichuan University, China. 2015 December. “Are egg yolks good or bad?”. Dr. Mercola. 2016 February. “What are lima beans good for?” Dr. Mercola. “Nutritional and health benefits of dried beans”. The American Journal of Clinical Nutrition. “Effect of beta-alanine supplementation on muscle…”. Nottingham Trent University, United Kingdom. 2010 July. “Vitamin E and cognitive decline in older persons”. Rush Institute for Healthy Aging, USA. 2002 July. 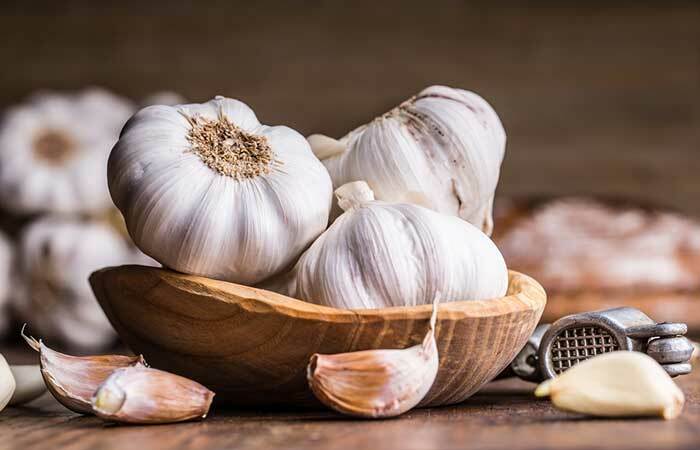 “Antioxidant health effects of aged garlic extract”. Tufts University School of Medicine, USA. 2001 March. “Riboflavin and health”. The University of Sheffield, United Kingdom. 2003 June. “Grass-fed beef: What are the heart-health benefits”. Mayoclinic. 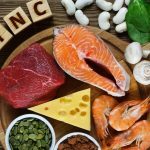 Zinc For Acne – Does It Really Help?